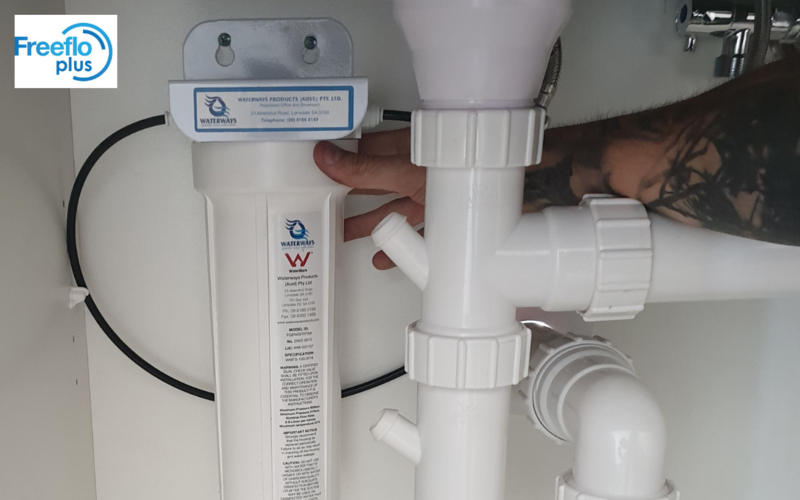 Freeflo Plus is the superior water filtration system available on the Australian market, the best drinking water solution we provide our customers, and is less expensive than most competitor brands. It has been specifically designed to provide you with a constant source of sweet tasting, clean, bacteria & chemical free water at just 33c per day over the lifetime of the filter. Waterways recommends changing filters every 12 months for average household use. Its superior four-way filtering technology removes 99% of the harmful bacteria, heavy metals, odours and all chemicals of tap water, and gives your family access to clean, safe, and delicious tasting drinking water from the comfort of your kitchen. The Freeflo Plus works four ways to give you better water! Removes Organics and Chlorine – The 0.45 micron filter takes out organics, chlorine, trihalomethanes, and all other nasties. Waterways superior technology allows the filter system to be stored in just one cartridge. Therefore, our system takes up 50% less room under your sink than most competitor’s brands. When you purchase a Freeflo Plus water filter system you have a choice of any of our designer taps either in single format or as a three-way mixer tap. The choice is yours depending on your kitchen aesthetic. Single Tap – A single tap provides a dedicated filtered water tap in your home. Your designer options for this tap can be seen here. Three-way Mixer Taps – this tap reduces sink clutter by having just one tap. Clean filtered water is accessible through this tap which also provides mains hot and cold water. Your designer options for this tap can be seen here. Removes heavy metals – zinc, lead, magnesium and other mentals can find their way into our water. By filtering your water you are removing these potential harmful bi-products. Six designer tap options available to suit any kitchen aesthetic. Recommend filter change once every 12 months to maintain water quality. Able to change the water filter yourself or have one of our experts do it for you. Waterways is a highly respected Australian water expert company, established in 1987. Filter cartridge life will be determined by the quality and the volume of the water that is being treated. We recommend that cartridges be replaced at least annually. Contact us today for a obligation free consultation on the phone and visit to your home or office.